The world renowned motherboard manufacturer MSI will display motherboard products that are equipped with Intel’s new generation 7 series chipsets and support Intel’s new generation 22nm CPU and PCI Express Gen3 specification at CeBIT 2012 exhibition that will be held at Hannover, Germany on March 6th, 2012. 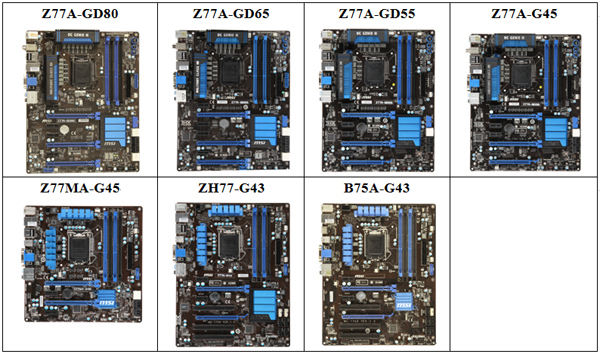 These motherboards include high-end Z77 chipset: Z77A-GD80, Z77A-GD65, Z77A-GD55, Z77A-G45 and Z77MA-G45; mid-end H77 chipset: ZH77-G43; entry-level B75 chipset: B75A-G43. With the adaptation of Military Class III components on MSI 7 series chipset motherboards, Military Class III components provide enthusiasts the highest quality and stability 1. MSI’s Military Class III components have passed seven rigorous tests, conducted by third party laboratories; the tests include extreme temperature, humidity, pressure, vibration and dropping etc., the components received the MIL-STD-810G Military Class Certification! In addition, the motherboards are equipped with several of MSI’s exclusive technologies: the industry’s simplest one second overclocking: OC Genie II; the most convenient UEFI and Windows dual graphical interface: ClickBIOS II; the design that allows users to switch BIOS freely and securely boot up the system: MultiBIOS II, etc.2, letting enthusiasts to experience the most convenient sensation. Only with such rich product lines that support the newest specifications and the use of the finest components are able to satisfy enthusiast’s demands. At CeBIT, MSI will also display the Big Bang-XPower II and X79 series motherboards that have beaten the highest core clock speed and FSB frequency records. MSI welcomes everyone to come to the exhibition and experience MSI motherboard’s cutting-edge qualities yourselves. Continuing MSI’s commitment to the product’s stability and durability, MSI’s 7 series motherboards also imported Military Class III components. In addition to importing Highly-conductive Polymerized Capacitors (Hi-c CAP), Super Ferrite Choke (SFC) and Solid Capacitors (Solid CAP), there is also the next generation DrMOS – DrMOS II. It is embedded with fully automatic dual-thermal protection; when the operating temperature reaches to about 115℃, an indicator on the motherboard will light up, warning the enthusiast to check MOSFET’s cooling status; if the operating temperature reaches to about 130℃, the system will automatically power off, ensuring the motherboard will not be damaged from high temperature! These components all passed rigorous testing conducted by third party laboratories: extreme temperature, humidity, pressure, vibration and dropping; and have received the MIL-STD-810G Military Class certification, making MSI’s Military Class III components the synonym for the highest quality and stability. MSI’s exclusive OC Genie II technology only requires one second to generate amazing performance increase, and also release the CPU, iGPU and memory performance at the same time, maximizing under the most stable situation and considerably saving enthusiast’s time for system adjustment. Once enthusiasts have activated the OC Genie function on MSI’s motherboard, it allows the iGPU’s performance to increase by over 36%! This allows enthusiasts to easily enjoy the performance explosion brought by overclocking. This is the world’s first system tool that integrated UEFI BIOS and Windows application programs; it allows you to adjust system settings under different environments through the mouse or even the LCD touch panel. Click BIOS II is also the world’s first BIOS that allows overclocking settings to be saved onto USB flash drives, and even allows overclocking enthusiasts to upload it to the internet and share it for other enthusiasts to use. It supports as many as 15 languages and is optimized for dozens of commercially available gaming mouse models. Such convenient and thoughtful functions are new technologies developed for MSI motherboards based on enthusiast needs. MSI’s Z77/H77/B75 series motherboards not only support the newest PCE Express Gen 3 specification, which is able to provide amazing 32GB/s bandwidth that has doubled compared to the previous generation, they also support the next generation 22nm process CPUs, allowing enthusiasts to use the newest specifications to gain the best usage experience.